Predavač: dr. Sc. Stjepan Tanić, dugogodišnji agrarni ekonomist Regionalnog ureda za Europu i Središnju Aziju, pri FAO. Dr. Tanić se u svom recentonom radu bavi lancima vrijednosti u poljoprivredno-prehrambenom sektoru te identifikacijom i procjenom uzroka i učinaka otpada od hrane. 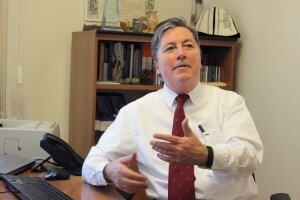 Stjepan Tanić Agri-food Economist was a Regional Office for Europe and Central Asia, FAO in Budapest. During his work with FAO, Mr Tanic has contributed to the preparation of reports, studies, publications and technical assistance projects in the area of farming systems development, farm management and agribusiness development, as well as the implementation of numerous workshops and meetings. Current areas of work are related to capacity and institutional development for inclusive value chain linkages, coordination and development; enabling environments for agri-food chain development; identification and assessment of causes and impacts of food losses and waste. Mr Tanic has contributed to a number of research, development and technical cooperation projects implemented within the framework of national and European research programmes, or supported by the FAO, World Bank, EBRD, and private sector. In various capacities during his career, he also participated in a number of bilateral and multilateral governmental activities, as well as meetings organised by international organizations such as OECD, FAO, World Bank and EC. Previously, Mr Tanić was an associate professor and research advisor on Farm management at the University of Zagreb, Croatia. He also served as President of the Agricultural Research Council in Croatia as well as the Deputy Minister for the Ministry of Agriculture in Croatia. Mr Tanic holds a Ph.D. in Agricultural Economics from University of Zagreb, Croatia. Nastava iz modula “Menadžment u agrobiznisu” počinje u ponedjeljak, 30. siječnja u 16h. http://mba.agr.hr/wp-content/uploads/2015/02/fav-01.png 450 450 MBA http://mba.agr.hr/wp-content/uploads/2015/02/mba_logo-011-300x85.png MBA2017-01-25 16:27:282018-07-07 18:06:55Nastava iz modula "Menadžment u agrobiznisu" počinje u ponedjeljak, 30. siječnja u 16h. Nastava iz modula Menadžment u agrobiznisu počinje 21. studenog 2016. u 16h. http://mba.agr.hr/wp-content/uploads/2015/02/mba_logo-011-300x85.png 0 0 MBA http://mba.agr.hr/wp-content/uploads/2015/02/mba_logo-011-300x85.png MBA2016-11-17 12:27:322016-11-17 12:27:32Nastava iz modula Menadžment u agrobiznisu počinje 21. studenog 2016. u 16h. Predavanja Marketing – MBA , 2015. Predavači: Tomislav Gligora, Fleksb1t, j.d.o.o. http://mba.agr.hr/wp-content/uploads/2015/02/fav-01.png 450 450 MBA http://mba.agr.hr/wp-content/uploads/2015/02/mba_logo-011-300x85.png MBA2015-11-12 12:38:202015-11-12 12:39:06Predavanja Marketing – MBA , 2015. Lectures on the module Marketing will be held during next week starting 16th of November 2015 between 16 and 20. Place: Department of Management and Rural Entrepreneurship (conference room). Lectures on the module Croatian Business Law and Contracts will be held during next week starting 19th of october 2015 between 16:30 and 20:30. Place: Department of Management and Rural Entrepreneurship (conference room). Lectures on the module Economics will be held during next week 1st-4th of september 2015 between 16:00 and 20:00. Place: Department of Management and Rural Entrepreneurship (conference room). Lectures on the module EU Food Law will be held in the period from 28th of september to 2nd of october 2015 between 16:00 and 20:00. Place: Department of Management and Rural Entrepreneurship (conference room). Lectures on the module Corporate Reporting will be held in the period from 29th of June to 03rd of July 2015 between 16:00 and 20:00 hours. Place: Faculty of Agriculture, Department for Management and Rural Entrepreneurship. Lectures on the module Introduction into Business English will be held during next week on 25th, 26th, 28th and 29th of May between 16:00 and 20:00. Place: Department of Management and Rural Entrepreneurship (conference room).